On this trek, Stevie explores the land where it all happened! Have you ever wondered how big the Sea of Galilee really is, or how hard it would be to climb Mt. Sinai? 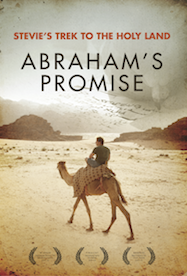 Have you thought, what was Abraham’s life actually like? Well, Stevie is in the land of the Bible to find out! We could spend out whole lives reading the Bible, and still find amazing new things every day. But for this trek, Stevie is going to follow one story that flows throughout the whole Scripture. It has many different heroes and villains and even more twists and turns and you can experience it all with him! Take a ride on a camel as he journeys back in time to the lifestyle of the Ancient Bedouin. Come to the city of Jerusalem where Abraham’s test truly begins, and join Stevie as he discovers how God uses one family to keep a promise designed for the whole world!